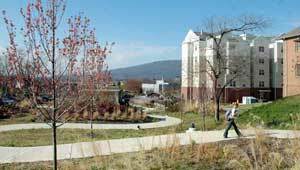 Since 1994, The Trust for Public Land has worked with the City of Chattanooga, acquiring land and easements to create a large system of parks and greenways. TPL helped the University of Tennessee and the City of Chattanooga to to develop a 1.2 mile greenway that runs directly through the Chattanooga campus and features a landscaped sidewalk, lighting, marked crosswalks and seating places. The scenic trail is a heavily-used route to campus for students living downtown and connects to an elementary school, which makes the campus accessible to student teachers and available for recess and field trips. Opened in 2005, the greenway extends from the Martin Luther King neighborhood, through the Tommie Brown Academy, across the UTC campus, all the way to the Tennessee River. Negotiations are underway for an expansion south to downtown.